How do you define success in your organization’s change efforts? Without giving this question much conscious thought, the change leaders, project managers, or the change consutlants may say “solve the problem.” Or “get the solution implemented.” Or “meet the deadline and budget.” These are all legitimate answers, and common ones. However, when you ask this question of senior leaders at the very beginning of their change initiative, their answers will shed light on how they think about change as well as the process they will support to get their outcomes. At Being First, we have five definitions of success that describe increasing Impact and value when transforming organizations. These levels depict five very different outcomes, and require different actions to achieve. The higher the level of success you pursue, the greater the ROI you will achieve from your change effort. The five levels have a “nested” relationship. The higher levels include and require achievement of the lower levels. What Does It Take to Achieve the Highest Levels of Success? When you pursue higher levels of success, you will need to pay more attention to your change process, conditions for success, and the human dynamics that arise. 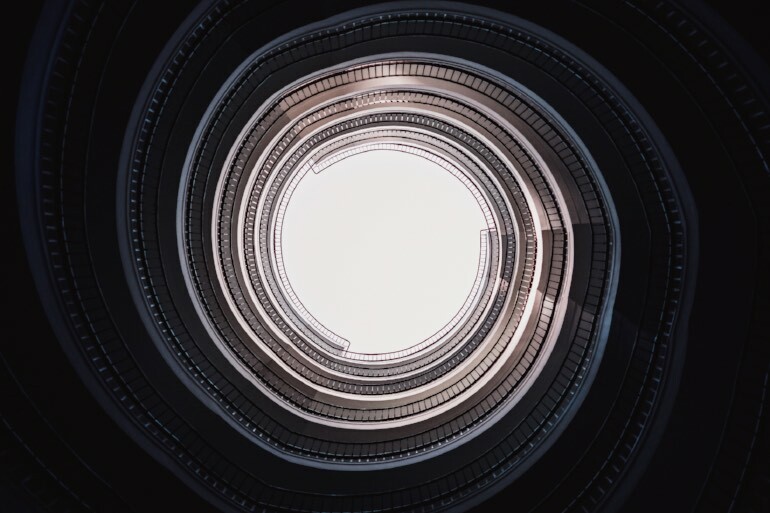 Because of this, success at Levels Four and Five requires far more complex and well thought-out change strategies and process plans than Levels One, Two, and Three. More time, more resources, and more “walking the talk” is required. 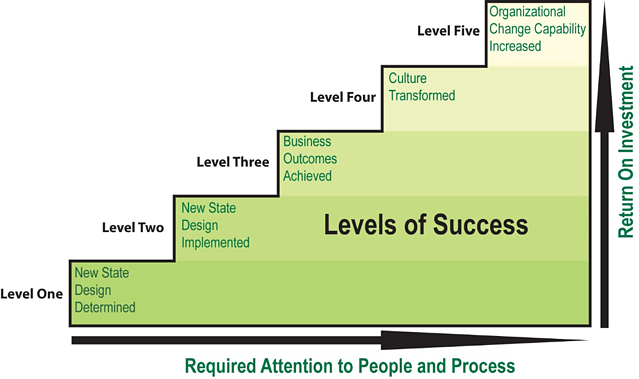 Most leaders say they want Level Four and Five outcomes. They want project success and business results as well as culture change and increased change capability. But we find that few leaders understand what it takes to achieve those outcomes. Their wishes do not produce them; good leadership, understanding of what it takes, and the support of the process is essential. Here are a few pointers for achieving each level. You have a clear “problem statement” and design requirements for your solution. The scope of work is understood. You have engaged people with the right expertise to generate the best solution design. You have a clear decision process to approve of the design. To achieve Level Two success, you need a change process that enables you to determine and understand the full impact of implementing your solution on the organization and the people who must make the change. You have generated a reasonable implementation or deployment plan and executed it so the new state is in the hands of those who must make it work. Ideally, stakeholders are trained to succeed in the new state. To achieve Level Three success, you must have committed stakeholders who have adopted the new state design and are living in or using it successfully. You understand how and when to measure the value of the new state on business performance. To achieve Level Four success, you need to assess the specific ways your current culture either supports or blocks the success of your new state design. From this, you will need to develop a culture change plan that is fully integrated into your project plan. Your plan needs to engage people to acknowledge how their cultural norms and behaviors need to change to support the new state, and be willing to do so over time. Your leaders will need to model the new mindsets and behaviors and be advocates for sustaining the changes in cultural practices. The rest of the organization will need to be aligned to the desired culture as well. Increasing change leadership capability is a change initiative itself, and can be addressed with conscious leadership attention to how your change project is being designed and led. Once senior leaders agree they want to build the organization’s change capability while they change, you will need to build a strategy to do so, including providing training and development in change leadership, best practice tools and strategies, coaching, and learning clinics to support real-time attention to how this and other change projects are being led and supported. Your strategy should include the development of leaders and management, project managers, change consultants, and project teams.